Business students at The Sixth Form College, Solihull took on a panel of dragons this week, as the annual ‘Dragons Den’ style event, sponsored by Key Construction (Midlands) Ltd and West Hart Partnership, took place. Three students presented their business plans to a panel of judges, which included Bernard Callinan (Managing Director of Key Construction), Jim Hart (ex-student, now running his own architectural practice called West Hart Partnership), Clare Sutton (Finance Director of the College) and Peter Brown (Procurement Manager at the College). They listened to the students deliver a 15-minute presentation of their business ideas, before firing questions at them to see how they handled cross examination. The winning presentation was delivered by Zair Afzal, who came up with a business plan for a food truck called ‘Brunchie’. 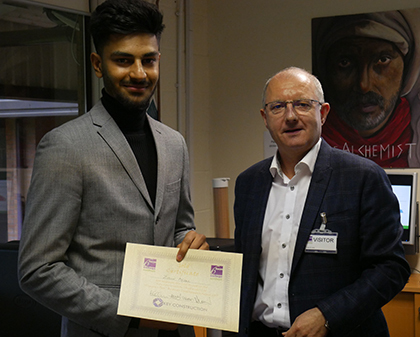 He received a gold certificate and £200 and will also be presented with a trophy at the end-of-year College Awards Evening. Second was Charlie Roberts, whose business idea was ‘Charging Heaven’, related to a battery charging service for mobile phones and other devices at music festivals and other events. He received a £100 second place prize, along with a silver certificate. In third place was a fast food business idea, which was the brainchild of Jasmine Mutter. Another business student had been planning to present his ideas, but could not compete through illness, but he will receive a token to mark the work he put in ahead of the day and Jasmine received a prize of £100 and a bronze certificate.